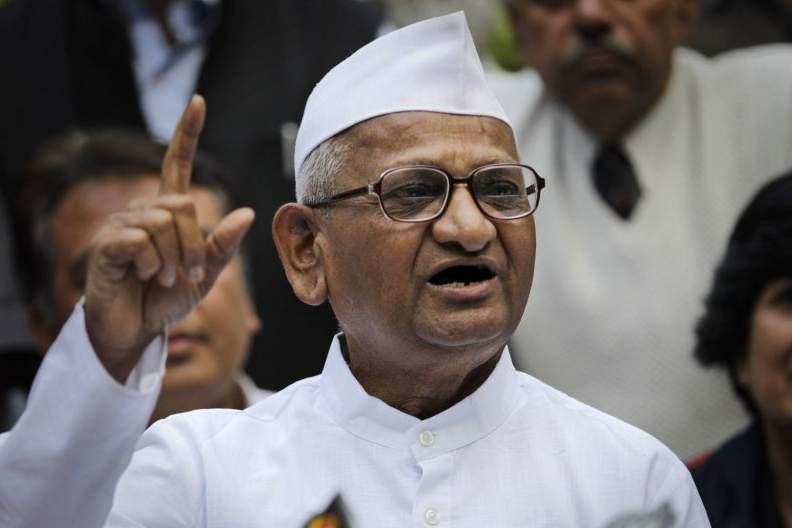 NEW DELHI: Social activist Anna Hazare said his efforts to communicate with the Modi government on issues of Lokpal and agrarian distress had yielded no result. "I have written 43 letters to the Modi government in the last four years but did not get any reply," he said soon after he began his hunger strike at Ramlila Maidan. "The farmers in the country are in distress as they are not getting remunerative prices and the government is not acting to ensure fair prices," he said. Hazare has been pressing for setting up Lokpal at the Centre and Lokayuktas in the states to probe corruption cases, bring in new electoral reforms and implementation of the M.S. Swaminathan Committee report to address the agrarian crisis in the country. He said he would hold discussions with the government during the agitation but his indefinite hunger strike, called 'Satyagraha', would continue "till the government comes out with a concrete action plan". The activist said, Union Agriculture Minister Radha Mohan Singh and some ministers from Maharashtra met him on Thursday and gave certain assurances, which he says he doesn't believe. Hazare said the Commission for Agricultural Costs and Prices (CACP), which decides prices for 23 crops, should be made autonomous for fair price fixation. Currently, the Central government controls CACP and cuts the fair price rates suggested by states by 30-35 per cent, he said. "I will prefer dying for the nation than by heart attack," said the 80-year-old activist, whose 2011 agitation gave birth to the Aam Aadmi Party (AAP) now ruling in Delhi. Last month, Hazare accused Prime Minister Narendra Modi of not being interested in the appointment of the Lokpal at the Centre. The veteran activist said Modi was "never serious about Lokpal". The reason behind the delay, he said, in the appointment of a Lokpal was because the Prime Minister was afraid that once this became a reality, his office, as well as that of his cabinet members, would also come under its purview.